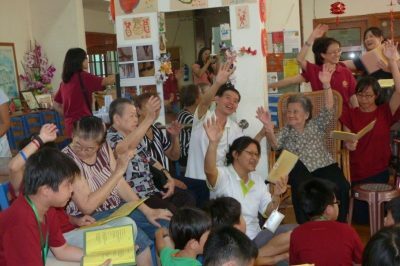 As Singapore is now also facing the aging population like many countries, Kampung Senang Day Care for the Elderly is set up in a cosy environment. Normal Elderly Care Centre is all locked up but at Kampung Senang Day Care for the Elderly it is an open concept area, facing a vegetable and herbal farm. With equipments for elderly to exercise on their own with Eldercare Officer’s supervision. There will be morning exercises and discussions for the day. With planned activities like a game of cupping, solving puzzles, doing origami, paper cuttings, paintings and different types of art and crafts throughout the day. The elderly will also be able to enjoy once a week refreshing Herbal Foot Spa. In the morning when elderly arrived, they are given a healthy drink like oat drink, almond drink etc or fruits. Lunch is served with wholesome vegetarian meals, some of the vegetables/herbs used are harvested from our community garden as part of the ingredients for their meals to keep them vibrant and healthy and snack time is also healthy desserts like beancurd barley, tau suan etc or homemade cake and bread. There are also free TCM services twice a week by volunteer TCM physicians and our elderly and the public can come and see them for their ailments. The volunteer TCM physicians provide acupuncture therapy, cupping therapy and herbal medication and medical advises. Our elderly and the public can just pay by way of donations. There is a day for our student care children to interact with our elderly by just simply talking and discussing their school days’ activities or some games activities. Occasionally we organized an outing for the elderly to places of interest. Schools plan their CIP and private organizations also visits our elderly centre regularly. Our Day Care for the Elderly is more like a second home for the elderly. Our aim for all elderly at our centre is for them to feel at home away from home.